Historically, new drugs have been discovered through the random screening of active ingredients from natural sources and then validation of the hits for activity in animal models. Screening, as the name implies, is a sifting process to find the few compounds in a large set that have a desired biological activity. The basic premise of screening is that biological assays are reproducible, reliable, and robust and biologically relevant. Enzo offers a line of products and services that can accelerate your drug discovery program. Our aim is to deliver innovative tools that make drug development more efficient, more cost-effective, and more successful. An assay is an analytical measurement procedure defined by a set of reagents that produces a detectable signal for quantifying a biological process. The quality of an assay is defined by the robustness and reproducibility of the signal in the absence of a test compound. Assay quality depends on the type of signal measured and this could be absorbance, fluorescence, luminescence, radioactivity, etc. Reagents, reaction conditions, automation instrumentation, as well as statistical models for the data analysis also play a role in defining assay quality. Assay quality and the quality of data collected influence predictive analysis of biological and pharmacological activities of a compound. Assay development is an objective method for screening putative compounds to determine interac-tion or modification of the target. Having a better understanding of the specific pathways involved in disease etiology helps researchers to de¬velop more comprehensive assays using emerging tools and technolo¬gies. During the design phase, assay conditions and procedures are selected to minimize the potential sources. False positive and false negative hit rates are related to the selectivity and sensitivity of an assay. A hit is defined as consistent activity of a molecule in a biochemical or cell-based assay and is expressed as percent activity relative to control compounds. Assay development and optimization process can be thought of as a cycle in which several variables can be tested and the parameters that give a better “reading window.” Optimization experiments depends upon the particular technology being used. A very important aspect of optimization is to improve the reproducibility and statistical performance of the assay by finding conditions that increase the signal-to-noise ratio with respect to positive and negative controls, and to decrease the inter-well variations that occur due to pipetting errors and temperature gradients across the microtiter plate. In general, coefficient of variations of less than 10% and Z values greater than 0.5 are desirable. Assay validation demonstrates that the assay is acceptable for its intended purpose. Rigorous validation is critical considering that assays are expected to perform robustly over several years during preclinical development. A robust assay requires that the measured signal is capable of providing data that is biologically relevant. From a pool of potential compounds, a few select leads that demonstrate a rela¬tionship between chemical structure and target-based activity in a bio¬chemical or cell-based assay are generated. Potential com¬pounds are screened through binding, functional, bio¬chemical, and cellular or cytotoxicity assays. High-throughput screening through a large compound library can identify multiple compounds. Progressing to a lead compound(s) involves cellular assays, toxicological assays, biopharmacological surrogates for absorption, distribution, metabolism, and excretion (ADME). Assays can be either cell-free (biochemical) or cell-based procedures. The choice of either a biochemical or cell-based assay along with the particular detection format is a matter of preference. Cell-based assays not only obtain potencies of compounds but also detect cytotoxicity, permeability and effects on growth at the same time, which can be viewed as predictors for late development. Cell-based assays accounted for greater success in identifying new classes of drugs in recent years and have thus become more favorable. Enzo Life Sciences offers a comprehensive product portfolio for Live Cell Analysis. Our CELLESTIAL® assay platform offers fluorescence-based live cell assays that are sensitive, highly specific, and optimized for the most demanding imaging applications, including microplate-based high content screening, ﬂow cytometry, confocal microscopy, and wide-field ﬂuorescence microscopy where consistency and reproducibility are essential. Likewise, enzymes are important drug targets and marketed drugs function through inhibition of enzymes mediating disease phenotypes. It is critical to have a thorough understanding of the enzyme biochemistry and the kinetics of enzyme action. 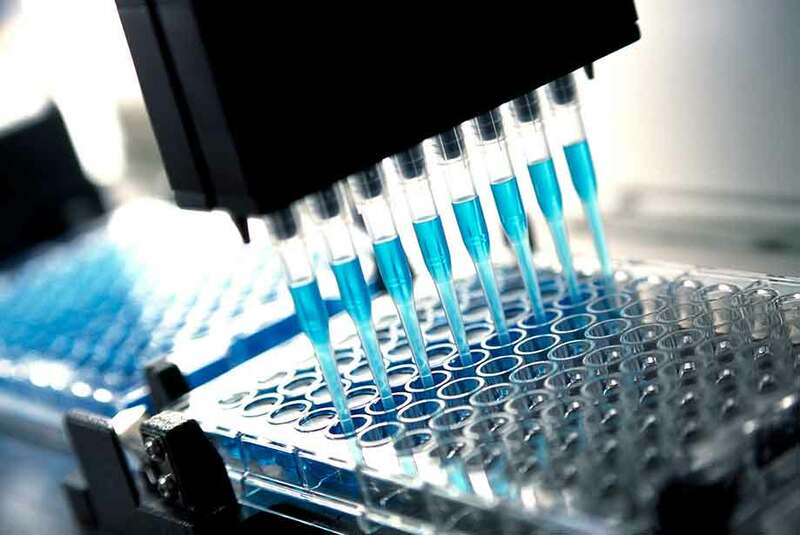 Our decades of experience in the design and manufacture of active enzymes and their substrates supports development of an ever-expanding portfolio of biochemical assays. Our menu of scalable enzyme activity assays is anchored by our MMP and Caspase Drug Discovery assay kits. A variety of assay detection methods, such as colorimetric, fluorescence, bioluminescence, and resonance energy transfer (FRET) are methods of choice for plate readouts. Fluorescence methods provide more sensitive approaches to the screening of small molecular modulators since they have the advantage of low background in addition to better signal to noise. Enzo offers high sensitivity colorimetric and fluorometric activity assays for screening MMP, caspase and collagenase and gelatinase inhibitors as well as highly active enzymes and specific antibodies for drug discovery projects. These assays exemplify the synergy of Enzo’s capabilities, assembling small peptides, active recombinant protein synthesis, fluorescent labeling and detection technologies, and antibody development into robust, reproducible assay kits. High-throughput screening (HTS) is the iterative testing of different compounds in an assay. A screen is generally considered high throughput if it can assay > 10,000 assays (wells) per day. HTS allows a researcher to quickly conduct millions of tests and to rapidly identify relevant modifier genes, proteins, or compounds involved in a specific biological pathway. The results of these screens typically identify new drug targets or drug activities at a single target and can unveil structure–function relationships in small-molecule “hits” and functional clustering within biological pathways. Enzo Life Sciences has a long and successful track record for ready-to-use methods for compound screening through a focused collection of unique compound libraries. In vitro screening systems and high-throughput screening have greatly assisted in improving efficiency of drug screening in the modern drug discovery process. Prior to the advent of these technologies, screening candidate compounds for biological activity was a major bottleneck in the identification of novel therapeutics. Figure 1: Enzo offers a line of products that can accelerate your drug discovery program. Advancements in cell isolation, cell line generation and cell differentiation technologies have led to more scalable and affordable cellular models, which in turn facilitate screening using more physiologically relevant cellular models. Due to its information-rich nature, high-content screening (HCS) has become the choice for scientists to examine the complex effects of compounds in physiologically relevant cellular models and pathways. HCS can be used to detect and monitor the aggregation of proteins. To monitor protein aggregation, Enzo Life Sciences has developed robust, quantitative detection of aggresomes to accelerate the study of neurodegenerative disease, liver disease and toxicology. Therapeutic protein formulations are often plagued by problems with protein aggregation. Unfortunately, monitoring and identification of these particles has been difficult and is limited to size-exclusion chromatography and native gel electrophoresis. In this study, flow cytometry and dyes specific to protein aggregates (PROTEOSTAT®) or oil droplets are used in combination to identify particles in a therapeutic formulation and assess the size of these particles. Figure 2: PROTEOSTAT® Protein Aggregation offers superior detection of sub-visible protein aggregates compared to conventional dyes. Figure 3: Effective linear dynamic range for antibody aggregate detection using PROTEOSTAT® Detection Reagent compared with Thioflavin T. Relative fluorescence unit values (RFUs) may differ depending upon the microplate reader employed for the analysis. Enzo offers a range of products to help you monitor product integrity, and maximize yield including highly sensitive and reproducible ELISA kits. Our Protein A ELISA Kit is a sensitive and reproducible sandwich immunoassay to quantify Protein A residuals in monoclonal antibody preparations. This extensively validated ELISA kit enables efficient detection of natural and recombinant Protein A constructs with up to 100% recovery. Our E. coli host cell protein ELISA kit are ideal for impurity analysis, Host Cell Protein quantitation, and Western blots. 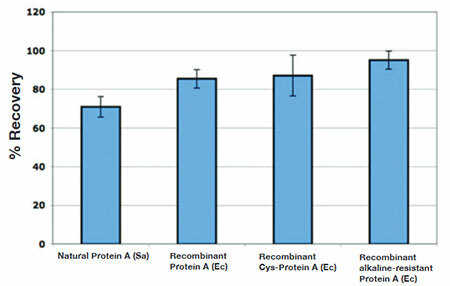 Figure 4: Protein A ELISA Kit recognizes all commonly used Protein A constructs. 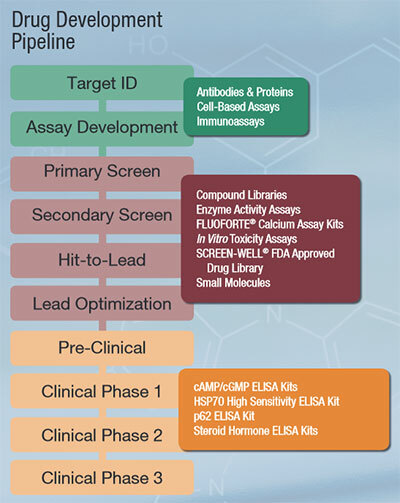 The basic techniques listed above provide an overview of the assays in discovery today. But all offer advantages and disadvantages. As our understanding of the biological processes underlying disease advances, there is a continual need to develop new techniques and assays to account for these increasingly complex systems. From our long-standing, flagship SCREEN-WELL® Compound library product family to our complex CELLESTIAL® portfolio of fluorescent probes and assay kits for cellular analysis, Enzo Life Sciences provides a wide variety of products for your drug discovery needs. Our decades of experience in the design and manufacture of active enzymes and their substrates supports development of an ever-expanding portfolio of biochemical assays. Please check out our Successful Research Tips or feel free to contact our Technical Support Service for further assistance.